Description: This coffee table hardcover book brings you 82 pages of important features of the magnificently restored interior and exterior of our beautiful Basilica. Read a brief history starting from 1749, when Father deBonnecamp for the French explorers led by Capt. Celoron and the local Native American inhabitants held the “First Mass”, to the present time. Learn what it took for St. Mary of the Assumption to become only the 76th Basilica in the United States and what that means. 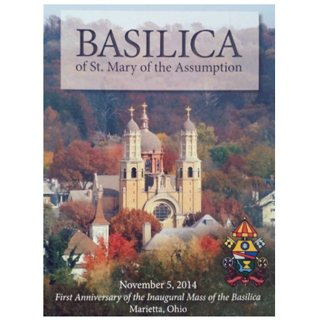 Our Basilica Book is a way of keeping members in touch with each other. In addition to the family portraits, there is a current membership roster, and an activity section, as well as additional pages, to add new members. This keepsake book will be treasured for many years. 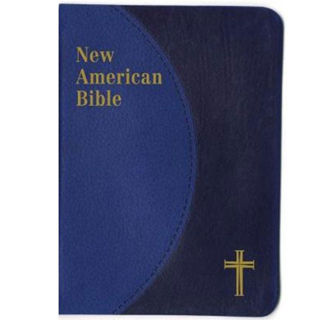 Description: The Personal-Size Gift Edition of the St. Joseph New American (Catholic) Bible includes the complete Old and New Testaments in compact, easy-to-read type. Many helpful aids for easy Bible reading include a valuable Bible Dictionary, self-explanatory maps, a doctrinal Bible Index, complete footnotes and cross-references, and 32 full-color illustrations. Also contains 4-page presentation pages and an 8-page Family Record. The Personal-Size Gift Edition of the St. Joseph New American (Catholic) Bible will make a cherished gift. Convenient, compact size, blue duotone imitation leather cover, gift-boxed. 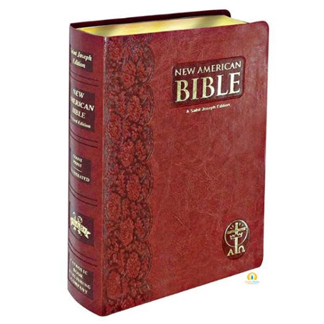 Description: The Giant-Type Edition of the St. Joseph New American (Catholic) bible features the largest type of any Catholic Bible in a comparable size. Includes the complete Old and New Testaments in giant, easy-to-read 14-pt. type; notes at the end of each book; footnotes; and full-color Land of the Bible section. The focus in this edition of the St. Joseph New American Bible is placed on the text, which is arranged for easy reading. Other features in this Bible include a Presentation Page and Family Record. Beautiful Dura-Lux binding. Gift boxed. Description: The popular Medium-Size Gift Edition of the St. Joseph New American (Catholic) Bible contains the complete Old and New Testaments in large, easy-to-read type, as well as many helpful aids for easy Bible reading including new maps, full-color illustrations, and Family Record. 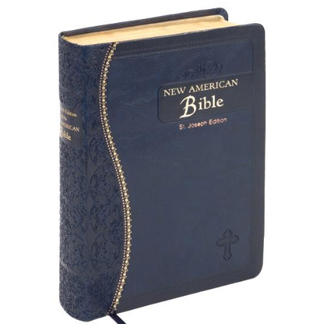 The beautiful and elegant features of this high-quality, medium-size St. Joseph New American Bible include supplement material, blind embossing, foil stamping, precise stitching, and decorative gilding to provide an exquisite and unique package for the Word of God. Gift boxed. 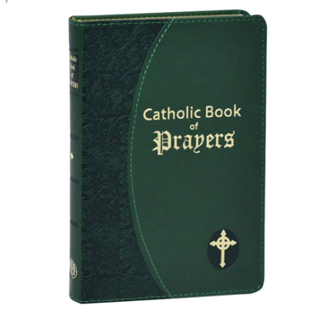 Description: The Catholic Book of Prayers from Catholic Book Publishing is printed in giant size type and especially helpful for use in dimly lit churches and for those with limited vision. Today’s most popular general prayer book, the Catholic Book of Prayers offers prayers for every day, as well as many special prayers including prayers to the Blessed Trinity, Our Lady, and the Saints. Compiled and edited by Rev. Maurus FitzGerald, O.F.M., this giant type book has a lovely green imitation leather cover with a ribbon for convenient place-keeping and can be carried easily in a purse or pocket. With a helpful summary of our Catholic Faith, this useful prayer book will prove invaluable for making regular prayer easy and meaningful. Description: This comprehensive, all-inclusive missal—with magnificent full-color illustrations—provides everything necessary to fully participate in each Sunday, Vigil, and Holyday Mass. The celebrant and people’s prayers (in boldface) are in accord with The Roman Missal, Third Edition. Offering the complete 3-year Cycle (A, B, and C) for all Sunday readings, this resource conveniently repeats prayers for each Cycle to eliminate unnecessary page turning. 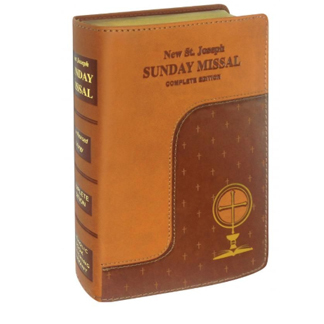 With its sturdy sewn binding, the St. Joseph Sunday Missal is designed to be treasured for a lifetime. 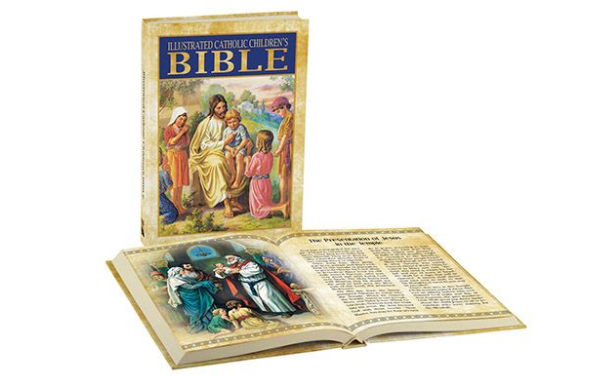 Description: Introduce children to a lifetime love of the Scriptures with this beautifully illustrated hardcover Bible. With more than200 colorful pictures, this Bible will capture even the youngest child’s imagination and heart. 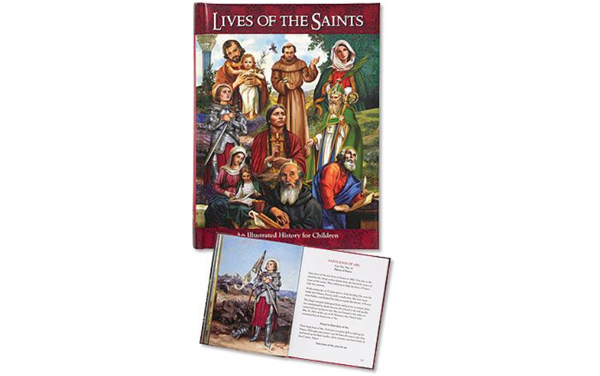 The Illustrated Catholic Children’s Bible includes a table of contents and a presentation page, making it ideal for gift giving. Developed for children in the early reading stage of ages 5-9, this Bible is a must for parents, grandparents and more to help spread the good news of Jesus with the next generation of believers. 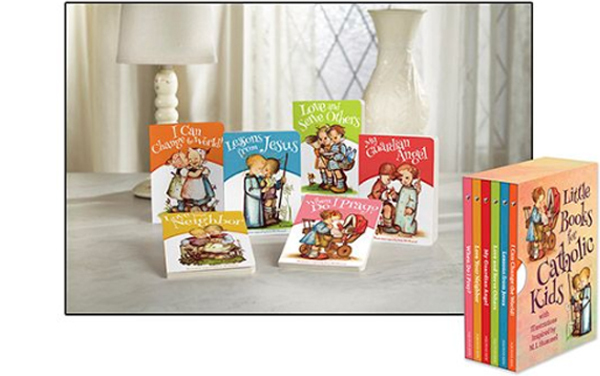 Description: These delightful board books with illustrations inspired by Sister M.I. Hummel® feature lifelessons for children ages 3-6, including when to pray, how to help others, being a good example and more. Ideal for teaching moments.